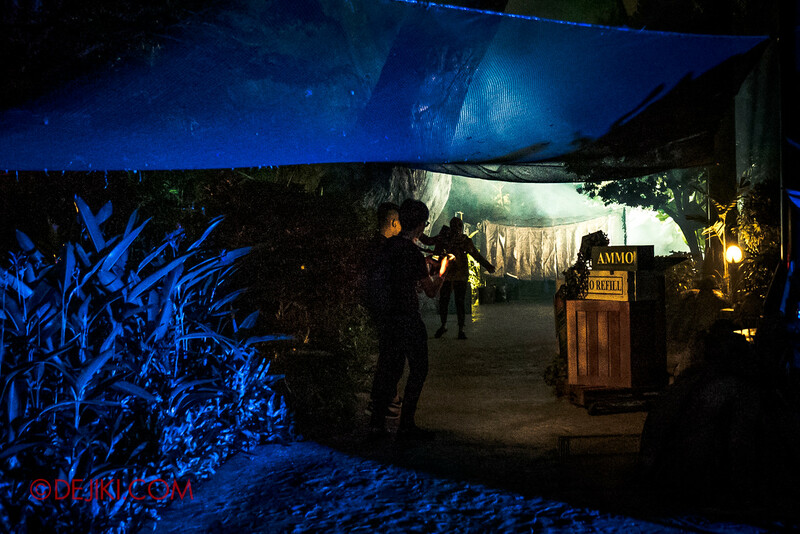 When darkness falls at Universal Studios Singapore’s Jurassic Park, the iconic themed area is transformed into creepy jungle overrun with the undead. You and your friends will form a platoon for the adventure, with a minimum party size of 4, and maximum of 8. Gear up with your own Battle Rifle Pro, and you’re ready to face the apocalypse. Use your ammo wisely, as there’s no unlimited supply, and you’ll need to find a reload point if you run out of ammo. After a thrilling slew of sprints and mini obstacle courses, you’ll meet another soldier. “Don’t shoot! I’m not infected – I’m the only surviving member of my team. I need your help to find the transmission code. There’s not much time – your team will need to split up and search for the code. The most exhilarating moments of ZLT come in bursts during the race to the finish. Zombies jump from very well-hidden spots. Shoot deftly, and don’t forget your mission. Use the code at the final gate to end the outbreak. The zombie nightmare is over, for now. You can check how well you did at the scoreboard. 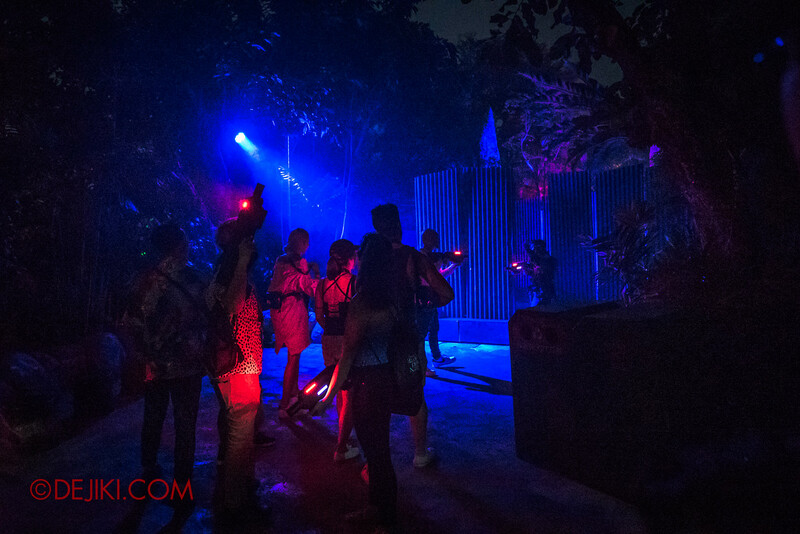 Zombie Laser Tag is a must-do attraction for thrill seekers and fans who need exciting zombie encounters to round off their Horror Nights experience. With teething issues from last year’s edition fixed, the ‘VIP zone’ had no delays affecting gameplay. 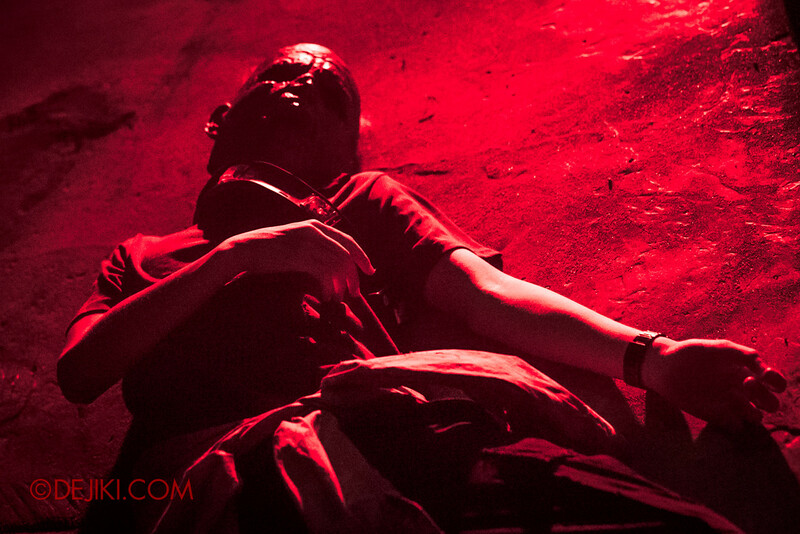 On the overall, it’s a short but thrilling experience. While Jurassic Park offers a game arena double the size of last year’s, the whole game wasn’t twice as long. With the new drill sergeant character, the pace of the game was kept very brisk, and there are ample wide spaces to rush through safely. There were minimal maze-like areas, which meant that some spaces could potentially be revisited, or there could even be an open arena space for a more traditional ‘laser tag’ game. 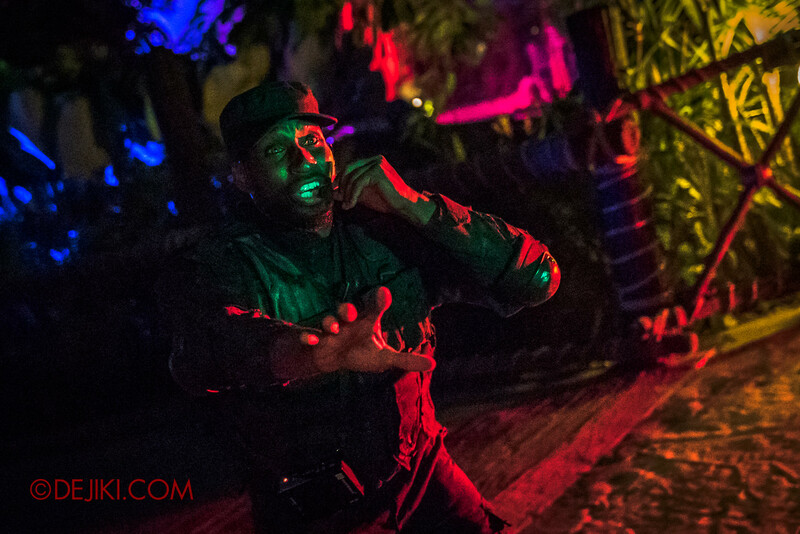 Perhaps in future editions the park may consider – apart from using an even larger space (somehow) – getting equipment that offers tactile feedback for the zombie scare actors, so that their performance could be more believable when they are ‘shot’ by the laser rifles. There is clearly some delay because they could only react after seeing the lights on their headbands change, and they sometimes miss it. The finale also needs a stronger kick, because it felt like “Well done pressing the right button. Please return your rifles and exit to your right.” At least you can take a photo with a zombie at the exit – don’t forget this exclusive photo op! 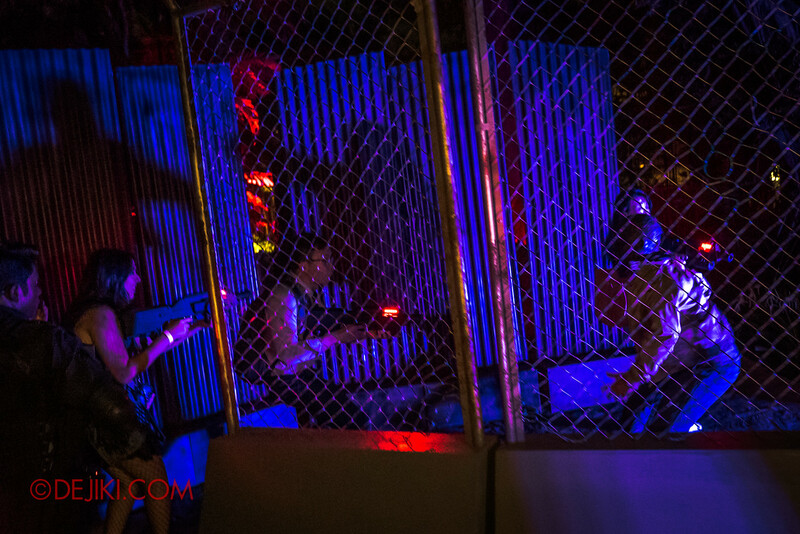 If you have played Zombie Laser Tag 2018, let me know your thoughts. 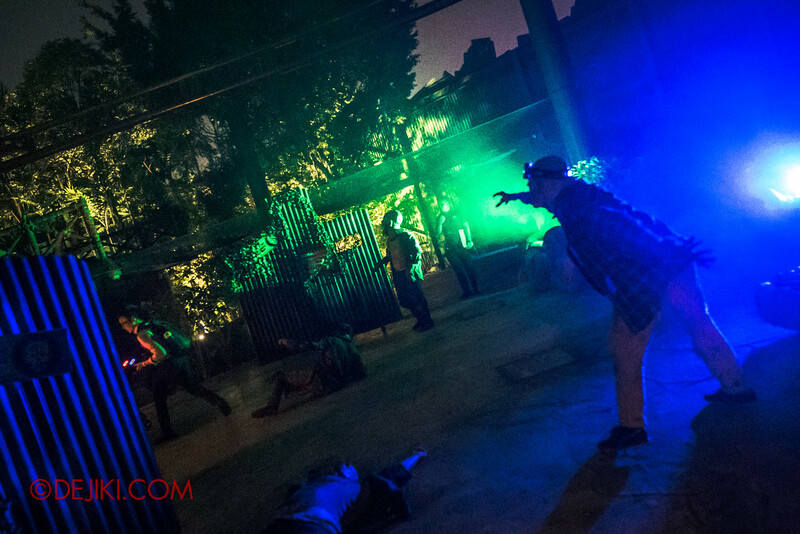 Zombie Laser Tag is a separately ticketed experience. It is not included with any HHN Admission Ticket or the RIP Tour. Guests will need to purchase tickets for a specific timeslot and arrive at Jurassic Park entrance gate punctually to experience this attraction. 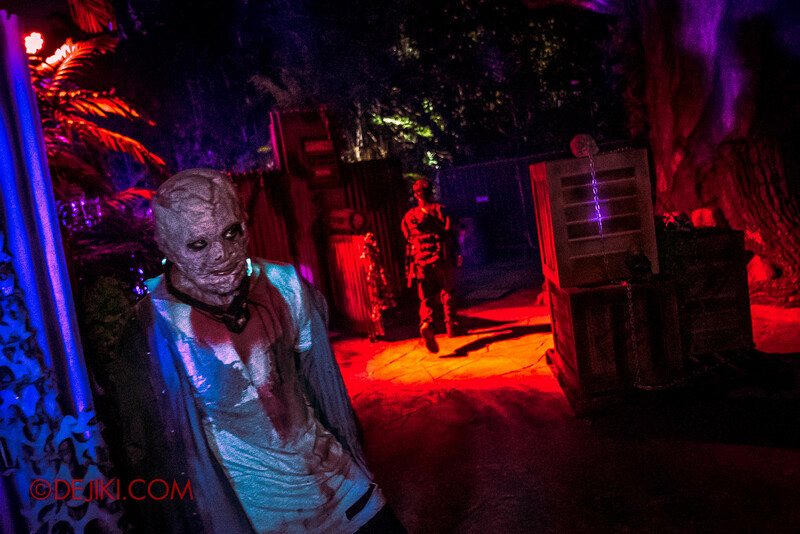 Get your tickets at HHN website or at the Zombie Laser Tag entrance. Hi dejiki, I really want to get into the killuminati secret room when I visit for hhn. Any tips? And do you think they’ll purposely not choose those people who are super super scared (because I am). If I keep repeatedly going for that haunted house, will it increase the chances of me getting picked? And how do you even know you are picked. I think I’ve already given the most important tip in my survival guide article. It is really up to chance and crowd levels. 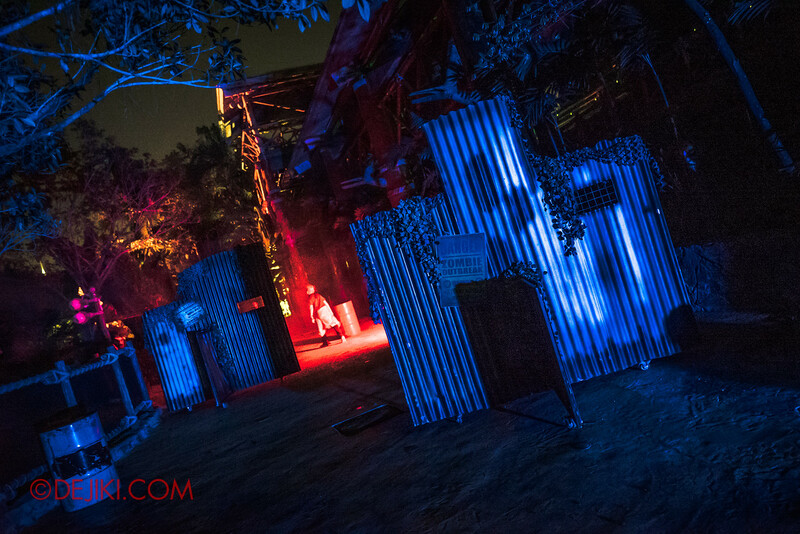 For higher chances, visit during quiet times (near park closing) when there are a lot less people in haunted house. I have done both the ZLT 2017 and ZLT 2018. As what you have mentioned, it’s twice the size but a quarter of the scare and excitement (in comparison). Less maze like and less scare actors and the vast expanse doesn’t create the eerie feel of how the zombies maybe lurching behind any walls. All in all out of a scale of 5 stars.